Oracle is delighted to have been selected as the 2017/18 Local Charity Partner for Sainsbury’s Southwark. Throughout the year, Sainsbury’s staff and customers will be supporting Oracle’s work through fundraising events, collections and awareness-raising. 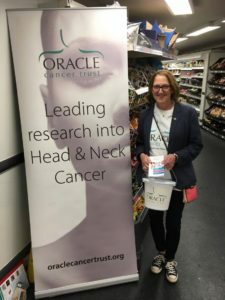 Pictured left is volunteer Katrina Doubleday who joined staff and other volunteers for the day to help with fundraising at the store in August 2017. Sainsbury’s also generously sponsored prizes for the Oracle annual charity golf day which was held at the end of September 2017. Sainsbury’s staff are busy organising more fundraising activities over the coming months.